Egyptian jazz musician Yehya Khalil is gearing up with his ensemble for two concerts in January; at the Cairo Opera House Small Hall on 17 and 18 January. Khalil opened the season on 15 November with the motto "unlimited entertainment," before other two concerts in December. 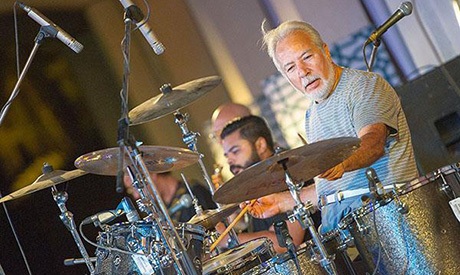 One of the pioneers of the jazz movement in Egypt, Khalil was recently honoured amid celebrations of the birth of the Cairo Opera House, mid-October. Late 2018, He received the Opera House-bestowed Lifetime Achievement Award for his "outstanding contribution in enriching musical life in Egypt," with the award handed to him by Minister of Culture Ines Abdel-Dayem. The King of Jazz, as his many fans describe him, lived in Chicago in the 1960s and 70s, after joining the American Music Conservatory for two years, played with a lot of know international musicians, including Jimi Hendrix, Ginger Baker, Jeff Bush and Eric Clapton, before returning to Egypt.